Inoria Bande, diatonic accordion's artist and unique voice, daughter of the big folk accordionist Francesco Bande, since of 4 years she works with the father and his music: infact her family praises 4 accordionist's generations. Her artistic maturation can be considerated complete, she can play the diatonic accordation and sing with a very acute tone in a kind of voice very personal; her “acute song”, that was played by her father also, is ispirated by nature's sounds and it can be useful to dance's incitement. Inoria is the artistic's director of the Museum and Social Club entitled to her father. 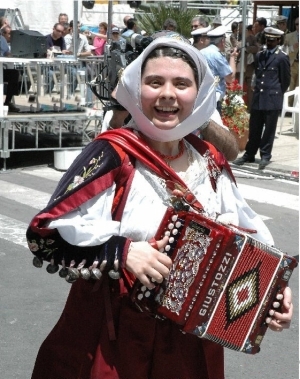 She is President of “Sassari cultural association ” and many other associations. She is partner of F.I.D.A.P.A. from 4 years, currently she covers loads with councilman, ago part of the National Association "Sassari Brigade" in quality of Patroness. She carries out intense artistic activity in Sardinia, Italy and foreign country. She has gained the national championship of diatonic accordion category 8 bass on 250 participants in 1997 to Torricella Sicura (Teramo). Currently she attends the Academic Course of Etnomusicologia near the Conservatory "L.Canepa". Inoria Bande officially opens the review of the dances of the "Cavalcata Sarda". 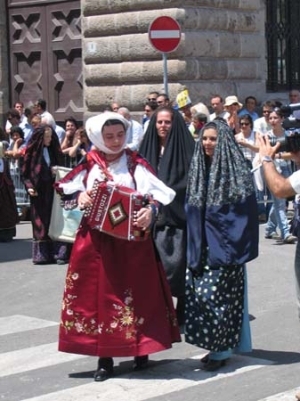 She opens the folkloric manifestation of the "fiera del folklore" and participates to the more sacred important like: S. Efisio to Cagliari. She is always present in the greater television transmissions like: Sardegna Canta (on Videolina), "a ninnora" and "Ammentos" (on Sardegna 1). Recent the interview realized from the TGR of RAI 3 in the rubrica "il Settimanale" replied to the regional television news (October 2007). Last the interview on RAI Educational transmitted to December 2007. Numerous her local and Italian interviews on reviews and daily paper. 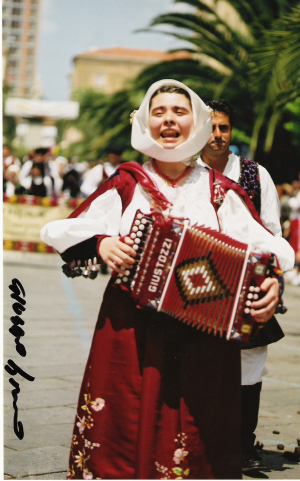 Currently she teaches Sardinian dance and diatonic accordian to Sassari, Bosa, Suni, Macomer and Valledoria (Civic Schools of Music "Planargia Montiferru" of Bosa and "Valledoria" Of Valledoria.